Colors: Colors are fawn, apricot and brindle. white markings acceptable on feet, chest and chin/nose. American Mastiff is a term that refers to a molosser-type dog that was created over 20 years ago by crossing an English Mastiff and an Anatolian Mastiff dog, a very old mastiff breed known for its intelligence and lengthy lifespan for a large breed. The American Mastiff has a much dryer mouthed than other mastiffs. 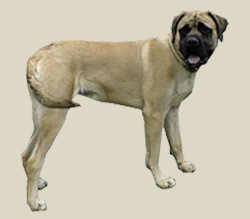 The dryer mouth is due outcrossing the English Mastiff with Anatolian Mastiff, which occurred early in the development of the breed. The American Mastiff is a large, massive, and powerful dog. The head is wide, heavy and rectangular in shape. The eyes are amber in color. Darker the better. The ears are rounded and set high on head. The muzzle is medium size and well proportioned to head and has black mask. The nose is black; It has a scissor bite: . The neck is powerful, and slightly arched. The chest is deep, broad and well-rounded, descending to the level of elbows. The ribs are well-sprung and extend well back. The back is straight, muscular and powerful, with well muscled and slightly arched loins. The forelegs are strong, straight and set well apart. The hind legs are wide and parallel. The feet are large, well shaped and compact, with arched toes .The tail is long, reaching the hocks. Puppies are usually born dark, and lighten as they grow older, some becoming very light fawn by age one year; some retain dark hairs. Colors are fawn, apricot and brindle. White markings acceptable on feet, chest and chin/nose; Temperament: Dignity rather than gaiety; quiet, calm, loving and loyal. Protective, but not aggressive. The American mastiff is a combination of grandeur, good nature, and gentleness. Dignity rather than gaiety. They are neither shy nor vicious. The well trained American Mastiff is calm, controlled, and confident. Understanding, patient, and loving with their family, especially children. They are generally aloof towards strangers. A well-socialized American Mastiff is friendly yet sensitive and alert to changing situations. They are not aggressive by nature but will defend their family if necessary. They respond to threats with judicious warnings and courageous action if needed. Mastiffs are inclined to be lazy but they will keep fitter and happier if given regular exercise. Like all dogs, the American Mastiff should be taken on daily regular walks to help release its mental and physical energy. It"s in a dogs nature to walk. They should always be leashed in public. The American Mastiff can do acceptably well in a small household or apartment if he is sufficiently exercised. They are comparatively inactive indoors, so their ideal living conditions would consist of at least a small yard or daily walks. The smooth, short-haired coat is easy to groom. Brush with a firm bristle brush and wipe over with a piece of toweling or chamois for a gleaming finish. Bathe or dry shampoo when necessary. This breed is an average shedder. Note: Obesity can be a problem.